This engineering text is directed toward Forensic Engineers who are interested in determining the causal factors of bicycle accidents. The author, a Professional Engineer and competitive cyclist and triathlete, has organized the engineering literature for this purpose. He also has detailed laboratory data and actual accident reconstructions for the readers’ use. 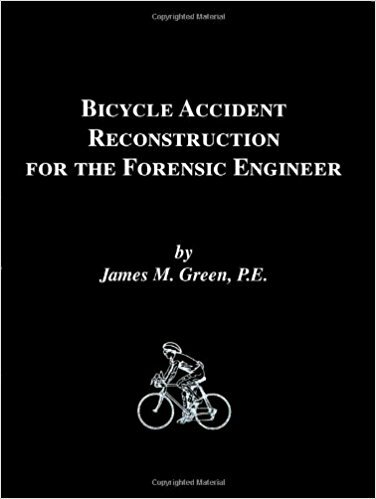 Jim Green is a Professional Engineer with over 30 years in reconstructing bicycle accidents. He continues to race competitively at the national level in triathlons. His company has utilized laboratory data, engineering literature and actual accident reconstructions to bring a level of confidence to the causal factors of bicycle accidents. Since there are many fine texts available on the general subject of accident reconstruction, it is not the purpose of this book to define basic forensic engineering techniques.